Pricing is according to how much I have procured the materials for, how much time I’ve spent on the item and the level of difficulty in making the piece. My aim to keep the jewelry affordable. I love jewelry and I love a lot of it, but I don’t run a bank. My inspiration is to create affordable beautiful pieces that I love and I hope you love too. If you are interested in discount prices either wait for sale items or send me a note directly with your predicament. Some of the bracelets are priced differently depending on how big or how small they are. 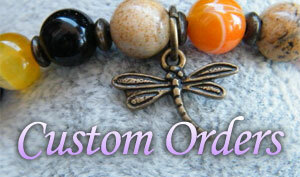 The pricing depends on the amount of beads used. The regular range of sizes small, medium and large are priced the same. Only the very small and very large are changed to accommodate the change of material and time. If you have a query about this, don’t hesitate to write. A note on gemstones, fittings and beads. All gemstones are marked to the best of my knowledge and research. If you have any questions or queries, please don’t hesitate (insert contact link) to contact me. The gemstones are irregular. There will be varying colours and lines. If your size is not here, please contact me and I will try to accommodate your size. Ring sizes are measured by the circumference of your finger. The easiest way to measure your finger size, is to take a piece of string and put it around your finger, then carefully measure it on a measuring tape or a ruler. Make sure the string can also fit over your knuckle. If you are still unsure, most jewelers should be able to measure your ring finger size. Most items can be made and shipped within a week of ordering. If there is a delay in handling your item, I will contact you. We’re a small business and we’re operating with the best possible outcome for you. We need a terms and conditions page in case there are problems that we cannot foresee. We accept returns for thirty days counting from the day you received your item/s . If you would like to return your item/s, you are responsible for paying certified shipping. We will refund the money you spent on your item/s and original shipping cost with no questions asked. We have made sure that you do not have to pay more than necessary for shipping costs. There are significant jumps in shipping costs at 100g and 500g. We are using Spanish Correos. You can see the prices here in case of doubt. We recommend, for your security, that you ask for certified “safe shipping”. It only costs 2.50 euros extra and guarantees your parcel’s arrival, as it requires signature at both ends and it is tracked all the way. However, that said, we have had 100% success rate with ordinary shipping thus far. Typically it takes two weeks to arrive to Australia, 8 working days to Norway. This is just a generalisation, and can vary depending on the seasonal traffic (like Christmas). But even though standard shipping has always arrived, we are not in any position to guarantee that your parcel will get to destination, as it travels untracked. In general, no refunds or replacements will be offered in case of a product not delivered and being sent through standard shipping. Still, contact us and we will see what we can do. Send us a picture and we will offer a replacement of the same product, if in stock, or anything else of the same value. In Spain: Please wait five days before querying your purchase. In Europe: Although most parcels arrive sooner, please wait ten working days before querying delivery. The rest of the world: Again, most parcels arrive sooner, but please wait 15 working days, or three weeks before querying your parcel. From time to time Patheya Jewels has special offers that can be applied to your order by using a promotional code that we provide to you. In order to take advantage of these promotions, you must enter the promotional code in the space provided on the Voucher Code page (found after you have entered your shipping address details) and hit the “apply” button. The value of the promotion will be applied to your order automatically. Please note only one promotional code may be used per transaction and cannot be used in conjunction with any other promotions. Patheya jewellery is hand made and/or procured – the metal components are described for each piece. All earring hooks are clearly marked on each page. When sourcing our components we try to always purchase nickel free, however, even though all cautions are taken, we advise that traces of nickel may be found in our jewellery. Always keep Patheya Jewellery stored in a safe place, hang earrings on an earring stand or on the side of a tall glass when you are not using them and keep all jewellery products away from perfume, moisturiser or hairspray. Pieces may be delicate so care should be taken when wearing and storing. Damage from careless wear/storage (including water damage) is not the responsibility of Patheya Jewels. All of our jewellery embellishing is set by hand, therefore, each piece will vary slightly. Please take special care of embellished pieces and refrain from getting perfume, moisturiser or hairspray on them. Given the delicate nature of the handmade process, we offer a 3 month warranty on all Patheya Jewel pieces from date of purchase. This warranty covers manufacturing faults (but does not cover neglect or wear and tear) and we will at our discretion replace or repair your damaged product.